It's 8:30 on the Sunday night after a glorious Thanksgiving break. Twas the break to trump all breaks. We slept in and stayed up late and watched movies and played games and went shopping and saw my family every dang day. It was so rad. Now I have to go back to work in the morning and I wonder what the heck is up with that. Can't we all just live in a world where there are no ends to Thanksgiving breaks? I guess that's called unemployment and they say it ain't as great as it seems but I don't believe them. 1) Monday night was the closing night of Les Mis. Them teenage actors were all crying because it was over and it was so freaking great and all that nonsense. I, on the other hand, was crying tears of sheer happiness because one more day of that crap and I think my marriage would have been over. Now I have my husband back! Also, Greg had the biggest audience for closing night than the school has had for a play in over ten years so maybe the blood, sweat, and tears were worth it? No. Definitely not. 2) Tuesday I went to lunch with one of my besties who now lives in California. Besties are awesome because they call you out on everything like having a messy car and running red lights. Strangers might notice it, but they don't say anything, you know. I love it when my out of state besties come and visit but it also makes me sad because why can't they live here all the time like they used to? 3) I started watching The Mindy Project. Greg had said he wouldn't watch it with me because he's not a big Mindy Kaling fan, (he's a fool) but after two episodes I knew he'd appreciate the writing even if he doesn't love Mindy. So I forced one episode on him, he was converted and now we're halfway through season 1. Cheers! 4) Wednesday night I saw Mockingjay. After seeing it I remembered why I didn't like the book. That is all. Also, I'm as big a J.Law fan as the next person, but I didn't love has as much in this movie. Don't hate me. We can still be friends. 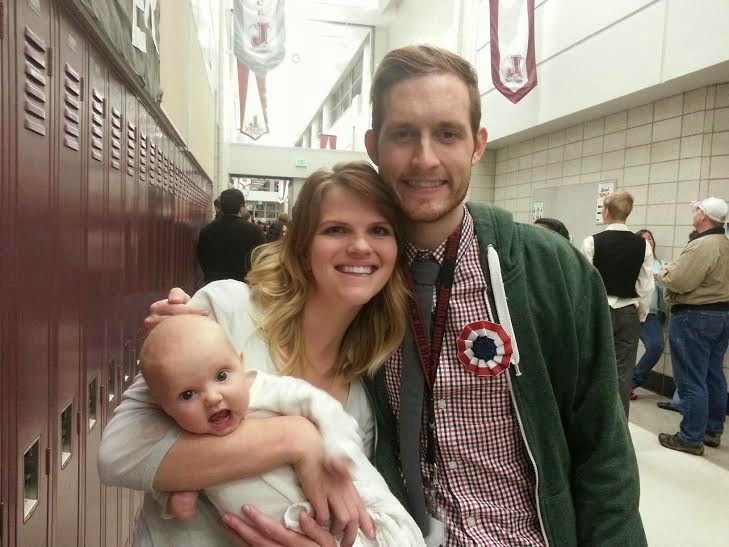 5) Thanksgiving was about as perfect as a day as they come. We decided to cut back to a smaller group this year- you know, down from 75 to about 35 no big deal. (There are eight kids in my family- add spouses and kids and the numbers add up quick!) My mom is becoming a better and better cook by the year, I swear. And she's always been amazing- it just keeps getting better. This Thanksgiving dinner was the best I've ever had. Perfect stuffing, hot homemade rolls, salad with the yummiest balsamic pesto dressing, yams smothered in brown sugar, fall apart turkey with some kind of magical French herb on it. There wasn't a dish that wasn't perfect. I was assigned to bring ice cream. I guess I complained enough about having to make pies last year that they gave me a non cooking ability. But seriously. Making pies was hard. Perfecting that crust is about as easy as perfecting a new language. Ain't nobody can do that right! Except for Mary and Trent who nailed the pies this year. So basically I just can't make pies. 6) After dinner we all went to my dad's grave. I was kind of worried that it would make the day sad, but it was actually a really beautiful way to have him there with us. Thanksgiving was my dad's favorite holiday so we all stood around his grave and said something we are grateful for. It was sweet and dorky and sublime all at the same time. It was one of those moments where you kind of step back and look at your life and think, "Yep. This is what it's all about." My mama and seven of her eight kids. 7) After the cemetery my mom insisted that I head up some games. Somewhere along the way I became the "game person" in my family. I know about three games and just recycle those at every family get together. No one complains because if they do, they get put in charge of the games. My mom acting out the drive in movie theater and my brother acting out getting hit by a meteoroid were highlights. 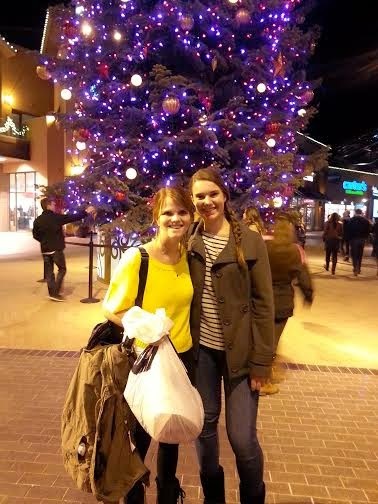 8) Thursday night I braved some "black Friday" stores with my French friend, Agathe. I am kind of over Black Friday. The extra ten percent off isn't worth it. This year I kind of felt manipulated/ taken advantage of/ conned. It's not a great feeling. I don't think I'll do much BF shopping next year, but Agathe really wanted to experience it, so you know, whatevs. She thinks us Americans are straight up off of our rockers to go out at 10pm on Thanksgiving night to get a good deal. But she thinks it is awesome that we have a holiday just for eating a big dinner and hanging out with our fams. ME TOO, AGATHE, ME TOO! 9) Friday we went to lunch with my sister, Mindy, and her husband, Ben. They live in Germany. We only see them once a year. (This year we saw them twice because Greg and I went out to Germany in June.) It was so awesome having my sister around. They even brought us our favorite European chocolate cookies and please don't ask me to share them with you because I just can't. I wish my sister lived closer to me but I remind myself that I get to visit her and go on lots of inexpensive vacations thanks to her nomadic lifestyle. (Military husband.) I miss having her around so it was awesome to spend a lot of time together. Also the lady at Cafe Rio got mad at me because I argued with her over how many free meal stamps she gave me. Sassy lady, that Cafe Rio worker. 10) Friday night I was in charge once again of planning games. This time with cousins, aunts, uncles, etc. It was wild. People get mad at you when you're in charge of the games, you know. It's not an easy position to be in. We were playing Family Feud and peeps kept getting mad because they were giving the wrong answer. Yo, it ain't my fault! After those games my cousin and her husband came over to our place and we played cards until 2 am. We ate buckets of popcorn and drank a lot of soda and acted like the true idiots we are. I felt like I was 18 again. Then June woke up at 7 the next morning and I remembered I am not 18. 11) Saturday we were supposed to get a tree and do some decorations. But then my mom called and said she was shopping at the outlets right next to my house so instead I went and got two new shirts. Almost as festive as decorating a tree, right? 12) Last night my family attempted to go to temple square. It was a zoo. There were 23 of us and temple square was beyond crowded. We got separated and there were a lot of panicked phone calls but somehow we all made it out alive. Note to self: Don't go to a busy public Christmas attraction with 23 people and expect to stay together. Note to self #2: don't go to a busy public Christmas attraction on the weekend of Thanksgiving and expect the crowds to be reasonable. THEY WILL NOT BE REASONABLE. 13) Greg was sick pretty much the entire break. He only joined in for about half of the festivities. He's had some sickness that has been hanging on for three weeks now. That is what happens when you spend 1000 hours directing a high school musical and survive on Reese's peanut butter cups and energy drinks alone. You almost die. He is finally on an antibiotic and so hopefully he'll get better although he's got a pretty nasty cough that sounds an awful lot like he's got the black lung. 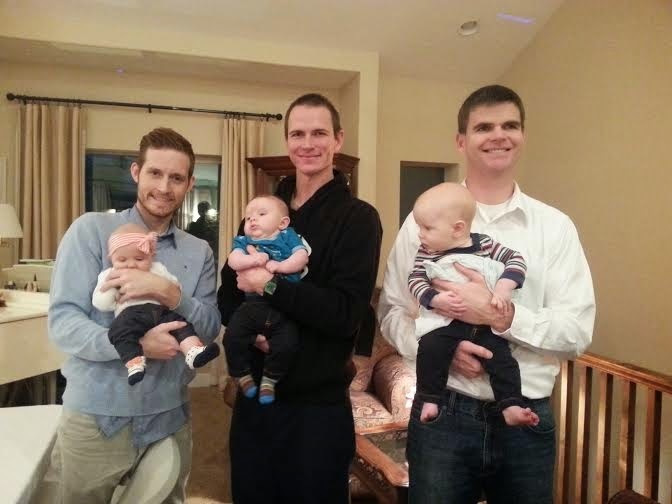 14) Two of my brothers also welcomed babies this summer. We had a lot of fun stripping the three cousins down to their diapers and taking pictures of them. If you don't think those babies are adorable then you have no soul. And that's a wrap! Three more weeks until Christmas break.